You are here: Home › Get Version › Maintenance › NFC HCE › SpringField › Support › SpringField Colorado makes it easy to recognize the SpringCard smart reader you are using! You know the scene in the movie where the support guys are desperately trying to help a customer configuring a very specific product, only to discover minutes after that the customer has a totally different product in hands? 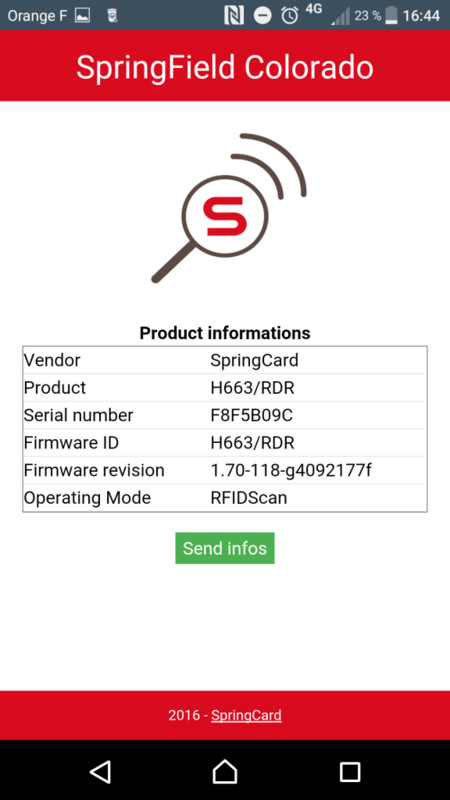 Since SpringCard offers a very wide range of products, and since most products look the same (well, there’s nothing that resembles more closely an OEM NFC/RFID device than another NFC/RFID device), we experience this frequently. Our customer’s technicians sometimes face the same situation, when they come to the field and don’t know whether a colleague has already upgraded a firmware, uploaded a new configuration, or not. 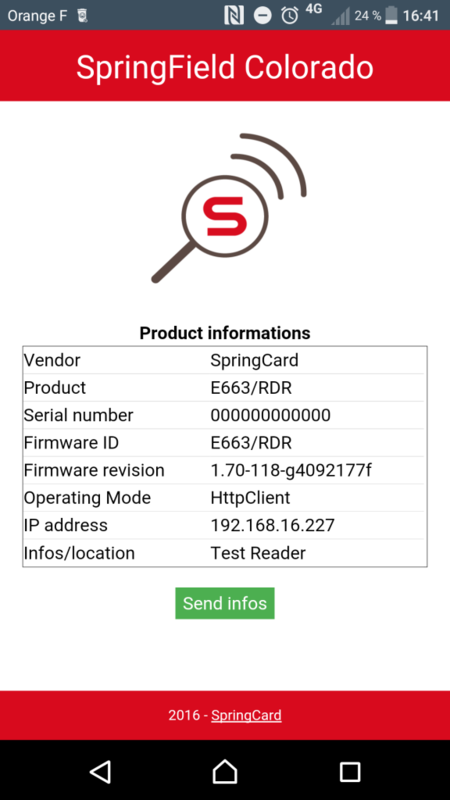 To ease the job of all support teams and maintenance technicians, we’ve introduced an exciting new feature in all the “smart readers” firmware (aka all /RDR and RFID Scanner products). Starting with FW version 1.69, the reader is able to communicate with an Android application (code-name “SpringField Colorado“) and sends its identifier, version, serial number… This application runs on Android 4.4 and later, provided that the smartphone supports NFC. It takes benefit of the NFC host-card emulation (HCE) mode. This screenshot shows the data of a Prox’N’Roll. It runs the H663/RDR firmware, i.e. it is a Prox’N’Roll Rfid Scanner HSP (and not a PC/SC coupler which doesn’t send anything to the application). This screenshot shows the data returned by a FunkyGate-IP NFC, i.e. a wall-mount reader running the E663/RDR firmware. The reader runs in the new HTTP client mode. Note that both the IP address (which has been assigned by DHCP) and the Info/Location field entered at configuration time are displayed. The communication is protected by a mutual-authentication scheme. This means that only the genuine SpringField Colorado application is able to get some data from SpringCard’s smart reader. Also, if you want to keep all reader’s data a secret, you must disable SpringField Colorado in the product’s configuration. To do so, edit your configuration using a recent version of MultiConf; open the node “Security and Services” and select “Disabled” under entry “SpringField Colorado Service”. Don’t forget to activate NFC on your smartphone to use this application!